The Imperial Japanese Navy was the second most powerful navy in the Pacific War in World War II and the third largest navy in the world after the U.S. and Royal navies. During the first years of the war the Japa­nese Com­bined Fleet, the IJN’s main ocean-going com­po­nent, domi­nated the Western Paci­fic with the world’s largest air­craft carrier fleet (21 fleet carriers and 4 light carriers), 12 battle­ships (in­cluding the world’s largest, the 64,000-ton Yamato), 141 de­stroyers, and 117 sub­marines. The war situ­a­tion pro­gres­sively worsened for the Japa­nese, and the terri­tories con­trolled by the “Area Fleets” fell one by one to the U.S. Navy, Army, and Marines. On this date in 1945 Vice Adm. John S. “Slew” McCain’s flag­ship, Shangri-La, began a series of tail­hook attacks on the rem­nants of the Com­bined Fleet anchored at Kure Har­bor south of Hiro­shima on the main island of Honshū. Carrier avia­tors flying Curtiss SB2C Hell­diver dive bombers and Vought F4U Cor­sairs had mauled Kure earlier in March. Now the Japa­nese fleet lay impo­tent and rusting in its an­chor­age, lacking suffi­cient fuel, air­craft, and trained air crews to harm the U.S. Pacific Fleet. The well-publicized July raids (July 24–26 and 28, 1945) had clob­bered prime Japa­nese tar­gets: three battle­ships, a new air­craft carrier, two heavy crui­sers, other war­ships, even tankers and a mer­chant ship. Thrown into the bar­gain were nearly 700 Japa­nese air­craft de­stroyed or damaged. The Kure raids were also con­tro­ver­sial. McCain and his staff, but not higher-ups Adm. William “Bull” Halsey and Fleet Admi­ral Chester W. Nimitz, opposed the raids because the Japa­nese ships in Kure har­bor had been reduced, for all intents and pur­poses, to serving as floating anti-aircraft bat­teries. That said, as a result of July’s three raids on Kure 170 avi­a­tors received Navy Crosses, the most since the four-day Battle of Mid­way in 1942 yielded 154 Navy Crosses to Navy men and Marines, against a loss of 83 Navy air­men. After the October 1944 Battle of Leyte Gulf had ended the offen­sive capa­bility Japan’s once-feared First Mobile Fleet (Dai-Ichi Kidō Kantai), Ameri­cans mocked the entire Japa­nese Com­bined Fleet as the “im­mo­bile fleet.” By the end of July, the “immobile fleet” was a hope­less, ineffective combat force. Left: On March 19, 1945, Vice Admiral (later Admiral) Marc Mitscher’s Task Force 58 aircraft car­riers made the first carrier attack on the Kure Naval Arsenal. On July 24 U.S. Task Force 38 launched a mas­sive attack to de­stroy any and all remaining units of the Im­perial Japa­nese Navy. Two-year-old light crui­ser Ōyodo, flag­ship of Vice Admiral Jisa­burō Ozawa’s Com­bined Fleet, was strafed and hit by four 500-lb bombs. 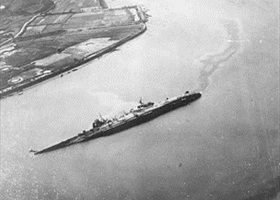 Four days later the Ōyodo was hit by four more bombs and cap­sized in shal­low water. About 300 crew­men were killed, while her remaining crew abandoned ship. Right: Aviators from the Shangri-La and the Wasp con­cen­trated on the battle­ship Haruna during their raid on Kure har­bor on July 28, 1945. Bombed more than any other Japa­nese battle­ship, the Haruna had been seri­ously damaged four days earlier, but this time she was holed on her port side, took on tons of water, and sank next to the pier with the loss of 65 of her 1,360 crew. Left: In October 1944 the Japanese heavy cruiser Aoba was attacked in Ma­nila, the Philip­pines, by carrier-based planes from Task Force 38. 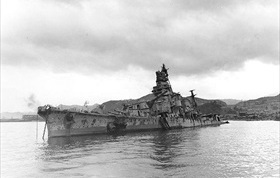 In Decem­ber the Aoba limped into Kure har­bor, was de­clared irre­par­able, and turned into a reserve ship. 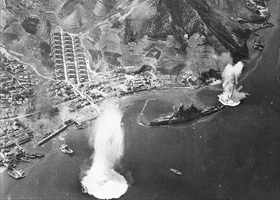 During the U.S. air raid on Kure in April 1945, the Aoba was further damaged and settled in shal­low waters. 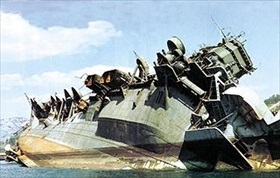 Hit again on July 24 and 28, 1945, she was a total loss. Right: The keel of the carrier Amagi was laid down in October 1942, and she was com­pleted in August 1944. On March 19, 1945, the carrier was lightly damaged by air­craft from Task Force 58. A month later she was per­ma­nently moored at an island in Kure har­bor and ex­ten­sively cam­ou­flaged. The Amagi was bombed again on July 28, but she had been aban­doned four days earlier. The Amagi’s sis­ter car­rier, the Katsur­agi, was mauled in the same air raid by a one‑ton bomb that blew out 20 ft of her port hull and 30 ft of her flight deck. The Katsu­ragi was used after the war to return thou­sands of Japa­nese sol­diers and civilians to the Home Islands.